Bridge reporter Riley Beggin moderates a panel on redistricting, campaign finance, and trust in government at the Michigan Good Government Solutions Summit on March 14, 2018. Why don’t Michiganders trust government? Where to start? “People feel like they’re being frozen out of the process,” said Craig Mauger, executive director of the Michigan Campaign Finance Network, which tracks money in politics. 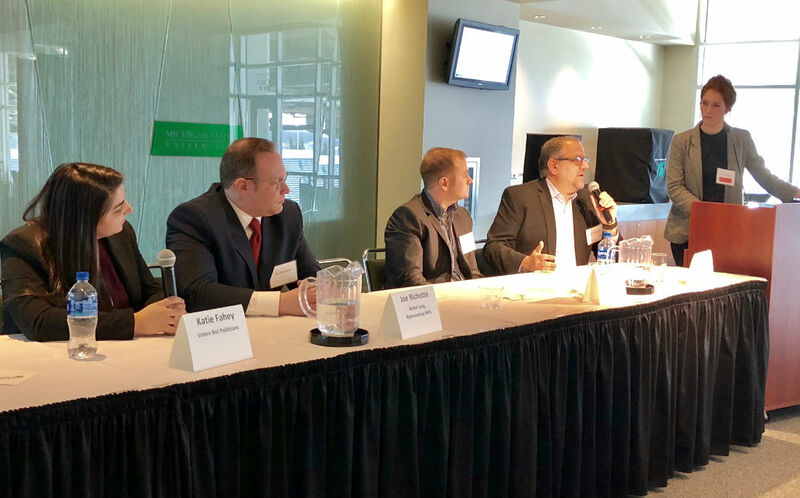 That was one takeaway from a panel discussion Wednesday during a Michigan Solutions Summit in East Lansing from The Center for Michigan. Other panelists included Katie Fahey of the Voters Not Politicians group, Joe Richotte,a Michigan Press Association attorney, and Republican political consultant Jeff Timmer, Managing Partner. Here are highlights of their discussion. Fahey is leading a ballot measure to ask voters in November to change how legislative district lines are drawn. The plan would give the task to a panel representing both major political parties and independent voters, rather than the majority party in power. “You actually get people acting better,” she said. Timmer countered that Michigan’s political process already requires the districts to be drawn to reflect population and existing political boundaries – and the proposed reform could have the opposite intended effect. “We’re going to find that there’s more politics, more bare-knuckles politics, involved in the redistricting process if this were to pass than has happened before,” he said. Only two states exempt the governor’s office, lieutenant governor’s office and Legislature from the Freedom of Information Act. Michigan’s status as one was exposed during the Flint Water Crisis. “You have a group of people who have to decide whether they’re going to open up the doors and the cupboards, and they’re happy to keep them closed,” Richotte said. A package of bills to expand the law unanimously passed the House in March 2017, but has stalled in the Senate. Both chambers are led by Republicans. Mauger said the 10 most-expensive state House races in 2016 cost $11.5 million, compared to $3.7 million in 2002. The amount spent by interest groups to lobby politicians also has increased over the same period, he said. Timmer said laws exist to allow residents to follow the money. “Voters can decide for themselves if they like the fact that a candidate is spending a lot of money, or not spending a lot of money,” he said. Pretty LAME answer from Timmer regarding "dark money". Wouldn't it be so much more logical to have all the amounts and SOURCES of monies attached to a candidate's name. Then there would be no mysteries.